Check Local Laws and Ordinances: Laws governing placement of fences and electric fencing vary from county to county. Questions such as: "How far must a fence be from a roadway? ", "Can an electric fence be used in a suburban area? ", and "Are warning signs required?" must be answered. Check with your County Extension Office or, if in town, your City Clerk's office. Multiply the length of your fence by the number of strands you wish to use and divide by 1200' = _____. This is the number of reels you will need. Add the number of corner posts and the number of end posts multiply by the number of strands = _____. Count the number of line posts with vertical changes in direction (hills, gullies, etc.) and multiply by the number of strands. Add these two numbers together (_____ + ______). This is the number of ElectroBraid™ Roller Insulators you require. Multiply the number of end posts by the number of strands =____. Multiply the number of corner posts by the number of strands and multiply by two =_____. Add these two numbers together ____. This is how many ElectroBraid™ Line post insulators you require. Pick the appropriate insulator for the type of line post you'll be using. Count the number of Line Posts multiply by the number of strands =____. This is the number of Line Post Insulators you will need. Copper Split-Bolts are used to terminate a strand of Braid™ or to splice two strands together.  Count the number of end posts multiply by the number of strands =____.  Count the number of fence lines that exceed the reel size you purchased multiply by the number of strands and multiply by 2 = ____.  Add these two numbers together =____. This is the number of copper split-bolts you require. Add the widths of all your gates together multiply by the number of strands=____. Measure the distance from your electrical outlet to the nearest point on the fence =____. 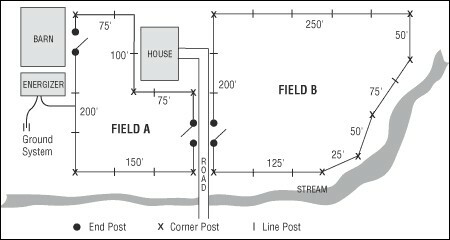 Measure the distance from your electrical outlet to where your ground rods will be located + (20' between ground rods) =____. Add these numbers together = ____. This is the length of copper lead-out wire you will need. You will need at least on ElectroBraid™ Tensioning Kit to tighten the Braid. For more information on different fencing configurations, special considerations of combination fence designs, please call us at 1-800-638-2123 and leave your number to call back .